LONDON--(BUSINESS WIRE)--Quantzig, a leading analytics advisory firm that delivers customized analytics solutions, has announced the completion of their article on the role of healthcare analytics in improving healthcare operations globally. This article highlights the impact that healthcare analytics solutions can have on businesses. It also gives an overview of how healthcare analytics solutions can help businesses in operating better by offering real-time information that can support decision making and deliver actionable insights. Adoption of digital tools like electronic health records (EHRs) has made data more structured in the healthcare industry. Additionally, it has improved the analysis to a large extent. Furthermore, the emergence of artificial intelligence and machine learning has made predictions and inferences easier than before. Ideas of video calls, doctor-on-demand, and Wi-Fi-enabled blood pressure monitors were a fantasy a few years ago. But today they are real and mainstream. This is persuading both healthcare providers and customers to adopt healthcare analytics rapidly to cut down costs, enhance patient engagement, and improve efficiency. Are you finding it difficult to deal with the regulatory pressures and constantly changing market dynamics in the healthcare industry? Get in touch with our experts and learn how our healthcare analytics solutions can help you address all your issues. Addressing key challenges, reducing costs, increasing margins, and gaining a competitive market advantage is not an easy task. To know how healthcare analytics solutions can empower your business with real-time decision making, request a free proposal. Still not sure how companies can understand, streamline, and improve their processes by leveraging pricing analytics solutions? Request for more information. 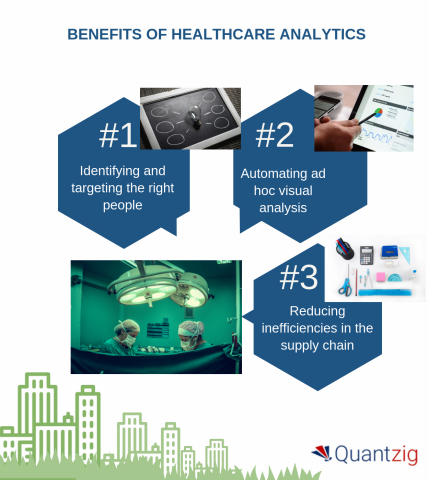 Quantzig has announced the completion of their article on the role of healthcare analytics in improving healthcare operations globally.